Feeding those in need in Westchester County, NY, through charitable donations. Good afternoon, everybody – On Wednesday in the morning we served a total of 30 families, including 52 adults, 44 children and 6 seniors. They were served by me, Benny, Carol, Eileen, Ellen, Kevin and Mary Anne. Then in the evening we served another 7 families, including 11 adults, 9 children and 3 seniors. They were served by me, Benny and Kevin. This brought us to a total of 37 families with 63 adults, 53 children and 9 seniors. We averaged 41 families a week in November. We received a windfall of food donations this week, some accompanied by monetary donations as well. Where should I start? On Tuesday morning the volunteers from Springhurst School arrived with over 1,000 food and toiletry items. There were five of us volunteers (including our friend, Bruce Platt) to welcome them with open arms. We marveled at the volunteers, led by Deborah Borwick, organizing this huge effort on the part of the third and fourth-graders, counting everything, packaging it up, loading it into a van, and lugging it into the church. Their strength was amazing. And just before Springhurst arrived Bruce and a helper came upstairs from the Community Nursery School with many boxes and bags of food donated by the nursery school families. Then, Carol Seischab came to help with the Springhurst delivery, toting two boxes of food collected by the parishioners at Zion Episcopal. Zion has regularly, consistently gathered food for us and, when the boxes are full, delivered it all through the year. Thank you so much to Zion for your attention to us, and thanks to Carol for carrying the food to us. Then, while we were putting the food away, a class of children from the Days of Wonder daycare center walked in with bags of food that their parents had donated. Each child was carrying a bag. A little later a couple from Aldersgate Methodist Church arrived with multiple bags of food, including two turkeys, brought by attendees at the Interfaith Caring Community’s annual Thanksgiving prayer service the night before. Everyone who came to the service brought something for the pantry. They came from Aldersgate, the Greenburgh Hebrew Center, Immaculate Conception Church, Irvington Presbyterian and the Church of St. Barnabas. And they took up a monetary collection and handed us an envelope full of cash they collected for us as well. The ICC is a wonderful, county-wide organization. Thanks to all of you, and to Alan Shapiro, the director of ICC as well. Then came Wednesday. When we arrived we discovered fifteen homemade apple pies from Mark Pennington, purchased from the Hastings High School culinary club. Next to the pies was a box full of oranges and apples from the Midnight Run. And out in the hallway were bags of food donated to us by our beloved Barbara M. and her mother and sister. And while the pantry was in session, in walked Barbara C.’s husband with food donated by Barbara’s students at Westchester Community College, together with food from St. Barnabas in Ardsley. And the largess continues. This coming Sunday, November 29, the Rivertown Center for Yoga and Health, located here at South Presbyterian Church, will be conducting a yoga class from 4:00 to 5:30 which will be a donation class. Whatever someone pays will be forwarded to the Pantry. They did this for us last year and gave us a sizable amount of money, which was used for extra food for Christmas for our clients. So, everyone on this list who is a yogi or a yogini should plan to be at Rivertown Yoga this Sunday. Thanks so much to Beth Bierko, Director of the Center, for doing this for us. This past Wednesday, as an extra treat, our own Jen Cadenhead came and did a presentation on sugary drinks and how sugar is metabolized in the system to the pantry clients as they awaited their turn for food. She’s an excellent presenter, and the clients ended up vowing to eat more fresh fruit instead of drinking fruity drinks in the coming weeks. It was entertaining as well as educational. She’ll be doing another presentation in January on vegetables. She’s ServSafe certified, and did a quick observation of our facility, giving advice and suggestions throughout. It was great to see her and to learn what she had to teach us. We now have three regular donors to the pantry, who have arranged with PayPal (through our website, http://www.dobbsferrypantry.org) to have regular donations made to us every month. This means so much to us to be able to count on regular donations. Thanks to all three of you, and maybe more regular donations will come in the future. One last comment – we signed up a new client this week. 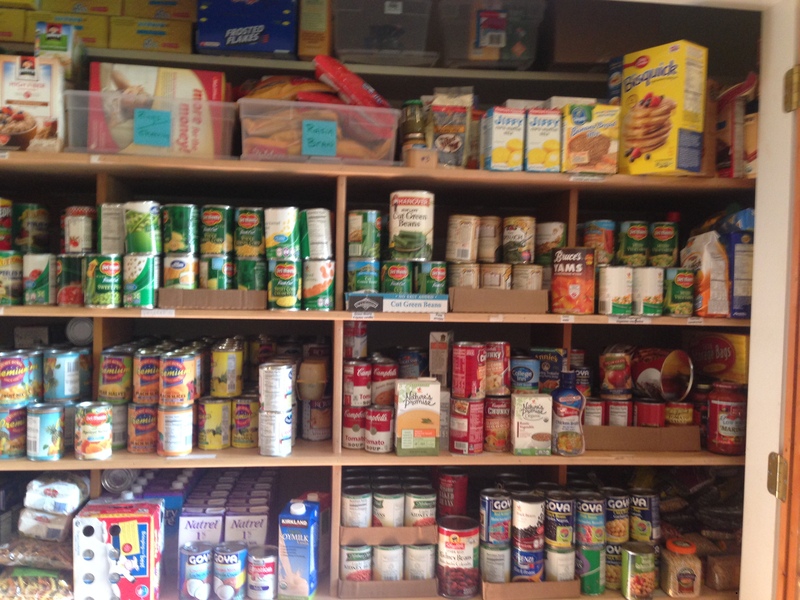 She learned about the pantry because her daughter’s third-grade class at Springhurst was collecting food for us. What wonderful karma. This woman will be helped regularly in the future because of Spinghurst’s – and Spring Community Partners’ – efforts. This is what it’s all about.